A "T-Ring" couples your SLR or DSLR camera body to a T-Adapter or other "T" threaded camera mount. 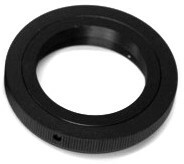 This T-Ring fits older 35mm FILM SLRs Only. Your Lens must Screw on to use this ring. For Pentax “bayonet” mount Cameras see #TPKM.